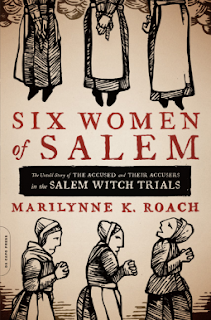 I must admit that, before reading the Six Women Of Salem by Marilynne K. Roach, I didn’t know much about the Salem witch trials. I only knew that some poor women had been accused of being witches, condemned to death, and burned at the stake. Actually, turns out I knew even less than I thought because none of the victims were burned to death. They were hanged. It was more merciful, I guess. But how the trials started, how they ended, who the victims and the accusers were were all things I ignored. Six Women of Salem answers these questions and more. In the book, Roach skillfully tells the story of the trials, focusing in particular on six women involved in them: Tituba, the slave who, with her accusations, started it all; Rebecca Nurse and Bridget Bishop, two old women found guilty of witchcraft and condemned to death; Ann Putnam, the mother of one of the accusers, a little girl who claimed she could see the spirits of the “witches” hurting people; Mary English, a rich woman accused of witchcraft which managed to flee from prison; and Mary Warren, who went from accused to accuser. The book is divided into three parts. The first tells us who these women were and what they did before the witch hunting madness swept through Salem. This section is full of dates and genealogy trees so can be quite dry at times. But if you make it through it, you won’t be able to put the book down anymore. The second part tells the story of the trials. Each chapter begins and ends with a short fictional account about one of the six female protagonists. Through this device, Roach really brings the trials to life and reminds us that these women were once real and alive, and it’s impossible for the reader not to relate to them and feel sorry for them. All of them, even the accusers. They too were just women of their time who were caught up in the mass hysteria caused by superstition, fear and prejudice. Even the judges at the trials were infected with it. The most flimsy and dubious evidence was accepted in court. Usually, all it took to condemned a poor and innocent woman to death was the word of a little girl who claimed to have seen her spirit hurt someone. As a result, 20 people were executed and five women died in jail. Many more were accused. Finally, the last section tells us what happened to the women who survived and to the families of those who didn’t. Six Women Of Salem By Marilynne K. Roach is one of the best books that I’ve read in a long time. It is accurate, well-researched and very informative, but is also very emotional. The story is told in an engaging style that makes the reader feels like he or she too is in Salem while this horrible page of history is being written. I would definitely recommend it to anyone interested in the Salem witch trials. Six Women Of Salem by Marilynne K. Roach tells the harrowing story of the Salem witch trials, focusing on the lives of six women involved in them. Some of these women were accused of witchcraft, while others were their accusers. But they all were victims of the superstitions and prejudices of their time. Informative and accurate, the story is interspersed with bits of historical fiction where the author tried to imagine what these women were thinking, feeling and living at the time. This gives a personal edge to the story, which is very emotional. Only at the beginning, when introducing the protagonists and their family histories, the book is at times a bit dry. Overall, this is a wonderful read that I highly recommend to anyone interested in the Salem witch trials.